Across the country orchards have been grubbed up, and local varieties of apples have vanished. Although some of these varieties are preserved at Brogdale National Fruit Collection, the true way to preserve them is to encourage people to eat or drink the different varieties, and celebrate their flavours and characteristics. Once lost from our food culture, they become mere museum pieces; culinary curios. Sadly it is increasingly difficult to sell unusual varieties through shops. "I can take Braeburns, Gala and Cox" is the usual reply. We grow over 40 varieties of apple and pear trees. Most of these are unsaleable through greengrocers. Did you know each variety of apple has a pollination date, a picking date, and an eating date? Natural sugar levels rise after picking increasing the flavour and aroma. 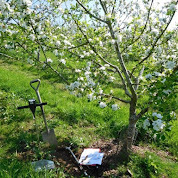 New commercial orchards are planted up with apples that supermarkets know they can shift, leading to large single variety plantings. These monocultures are harder to control for pests and disease. They are also more vulnerable to extreme weather conditions than a diverse orchard. At the beginning of May 2011, we were in the grip of a drought that was affecting many of our trees. But not all of them. This is the key to one of our principles - to build diversity into our production so that we are less vulnerable to the extreme conditions that we are increasingly experiencing. It also builds a diversity into our landscape, provides better habitat, and feeds the soul! Please note we have scaled down our apple juice production. However, it is still available to purchase through Brockweir & Hewelsfield Village Shop and The Dean Forest Food Hub.